Grim future for historical gardens? Walking the 6.5-kilometer length of the city's ancient land walls my first year in Istanbul, I was delighted to discover lush green vegetable gardens (photo, right) growing in the shadow of these 1,600-year-old fortifications. Later, I learned from a historian specializing in Ottoman gardens that these small market plots -- known in Turkish as bostan -- were established on very fertile soil and had been handed down from generation to generation for hundreds of years. As with so many other things at that time, it seemed perfectly reasonable to assume that tradition would continue on for many more generations to come. 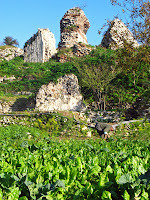 But this summer, with the dust from the Gezi Park turmoil not yet settled down, I received an urgent message alerting local press that bulldozers had moved in to raze some of these gardens near the Yedikule fortress. With tensions high in the city, a fellow foreign journalist and I who arrived on the scene to report on the story became embroiled in a heated conflict over the future of the gardens -- and even targeted as interlopers by supporters of their destruction. The angry rhetoric being spread at the highest levels throughout the Gezi Park protests was on full display. Shaken but undeterred, I wrote a piece for The Atlantic's CityLab (formerly The Atlantic Cities) about the threat to the bostan and how it ties in with larger issues of urban planning, public space, and public participation that are currently the subject of hot debate in Istanbul. My story was subsequently picked up by the regional news sites Eurasianet and Green Prophet, and my photos of the bostan used by the ecological agriculture website A Growing Culture. 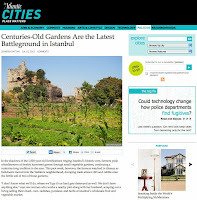 Read my article, "Centuries-Old Gardens Are the Latest Battleground in Istanbul," on CityLab.